Welcome to Making-Mosaics.com! My name is Paul Vlasblom. I have been installing tile for over 15 years now but I really discovered mosaic art just a few years ago. Ever since I have been trying to incorporate a mosaic in any project I undertake. Actually it is my sister that first introduced me to mosaic art. One day I went over to her new house. When I first walked in I noticed a mosaic in the entrance. I walked in a bit further and saw one in the kitchen. She really has them all over, the dining room, the bathrooms, the hallway, the staircase landing... you name it! I just could not believe my eyes, where on earth did you get all these I asked! It is when she replied that she had made them; I just could not believe that my sister can actually do these beautiful mosaics. Since I was in the process of renovating my own house, I wanted to try my hand at mosaic art. That is when I started and ever since I have been hocked on mosaic art. I am self tough and have no formal training on mosaic art. Here is my first mosaic medallion. As I started my discovery of mosaic art I realized that there was a lot of missing information. Sure there are a lot of web site with beautiful pictures but how do you actually create them was my question. One thing I noticed was that there were no patterns available online, even less free patterns. Clear patterns with measurements were not easy to find. This is when I decided to create a web site all about mosaic art, how to create it, and supply readers with free patterns. What methods to use and how to use existing materials you have lying around. I would also like to have pictures of your mosaics displayed as well in this site. If you have created a mosaic and want to display it to the world, just add it in YOUR Gallery. By doing so you will create your very own web page that you can share with friends and family. They can even leave comments! Remember... the making-mosaics photo gallery is YOUR gallery so add your contribution today! If you have any questions or have information regarding mosaic art that I do not cover in the site, please let me know through the contact us page. I welcome any comment and would love to hear from you. 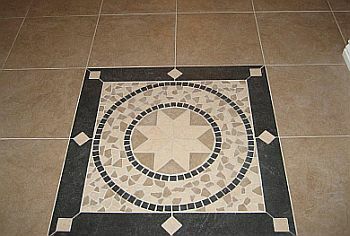 New at Making-Mosaics.com! You can now purchase handmade mosaic ceramic tiles. I now have ceramic circle tiles, squares, other shapes, heart, swirl and wave shaped tiles and a growing selection of very original Ocean Theme ceramic tiles. Still much more to come so drop by now and then to see the increasing selection of ceramic tiles for sale. Thanks for stopping by and I hope you will return soon! I enjoy supplying free patterns and advise. To help me continue you can, if you wish, donate through Paypal.